If you're looking for a marketing automation tool to help you create and send custom email campaigns with ease, Drip fits the bill. 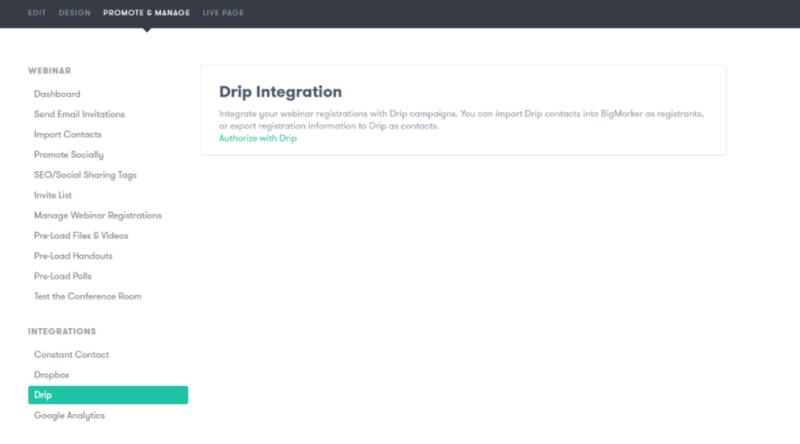 If you're looking to integrate Drip with your webinar software, you can have your cake and eat it too. BigMarker now integrates with Drip. With all of the hard work you put into setting up a high-converting webinar, reaching your audience should be the easy part, right? Unfortunately, this isn't always the case. Oftentimes, marketing efforts can become disjointed when using several different tools. A problem that many marketers struggle to resolve. Luckily, BigMarker and Drip have partnered up to streamline email marketing and webinar hosting into one simple process. Drip's easy-to-use email software not only allows you to create beautiful, custom emails, but also helps you segment your email lists into different funnels to help you target your messaging even better. 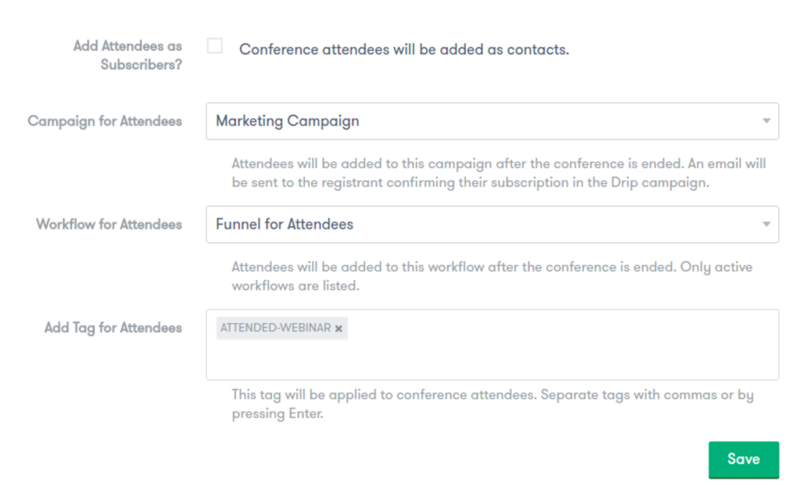 Leveraging Drip's integration with your BigMarker webinars will help you trigger email workflows based on your webinar registrants’ and attendees’ behavior. And the best part? The integration is automated. Simply walk through the steps below and you'll be ready to go in just a few minutes. 1. Log in to your BigMarker account and go to the Promote & Manage section of your webinar. Click on “Drip” under integrations. 2. Click on “Authorize with Drip” This will redirect you to Drip’s website, where you can authorize BigMarker to access your Drip accounts. Click “Authorize” to continue. 3. First, pick which Drip account you want to access. This will give you access to all contacts, workflows, and campaigns in your Drip account. 4. The following steps are all optional. If you would like to add webinar registrants to a campaign in Drip, choose an item from the “Campaign for Registrants” dropdown list. To add webinar registrants to a workflow, select a workflow from the dropdown menu. To apply a tag to registrants, enter a tag in the “Add Tag for Registrants” field. Press Enter to apply multiple tags. If you want to add registrants to your Drip contacts without doing any of the above, check the “Add New Registrants Automatically?” box. If your workflows or campaigns were just added and are not showing up in the dropdown menus, try refreshing the page. 5. The next section is for webinar attendees.If you would like to add attendees to a campaign in Drip, choose an item from the “Campaign for Attendees” dropdown list. To add webinar attendees to a workflow, select a workflow from the dropdown menu. To apply a tag to attendees, enter a tag in the “Add Tag for Attendees” field. Press Enter to apply multiple tags. 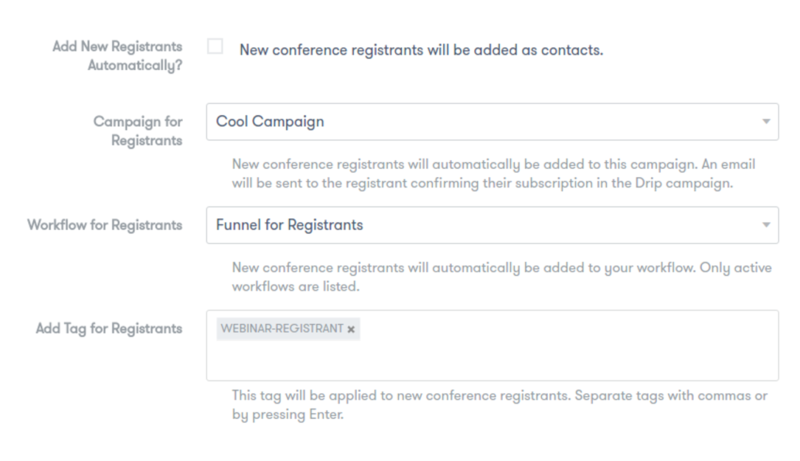 If you want to add attendees to your Drip contacts without doing any of the above, check the “Add New Attendees Automatically?” box. Refresh the page if your campaigns or workflows are not listed. 6. Finally, click Save at the bottom of the page to submit your changes. BigMarker also integrates with Salesforce, Infusionsoft, HubSpot and over 500 other marketing tools. Any activity or action around your BigMarker webinars can trigger tagging prospects, adding data to customer records, or logging activity in whatever platform you use to manage customer relationships. Don't have a BigMarker account yet? Sign up for a 14-day free trial today.